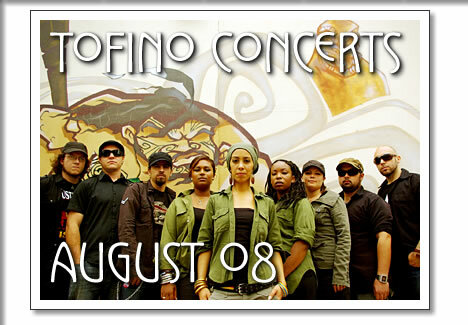 The following concerts in Tofino are happening in the month of August 2008. Tickets are available at Tofitian and Long Beach Surfshop in Tofino. Daniel formed his first band at the age of fifteen, the punk rock outfit called The Dropouts. Continuing on with the hard rock scene, Daniel picked up the guitar at sixteen and fronted local bands Audiophile & Replica. Tired of the constrictions of a rock band, Daniel went out on his own and in the summer of '06 wrote and recorded his debut solo album Outlaw. With beach, reggae and rock sounds, Daniel was finally playing the kinds of music that he was longing for. Blue King Brown is a band for your hips, heart and head. The Australian collective melds a deeply percussive sense of rhythm with sweet melodicism and politically astute lyrics. You can hear the afro-beat, reggae slink, world and Latin influence but the band has created a distinctly original sound and they've hit the sweetspot. A refreshing modern take on roots music, uniquely Australian with an unquestionable international feel. Blue King Brown are known for their full force, high energy, live show. In their short time on the touring circuit, bkb have established themselves as a revered name in the Australian music scene and have amassed a solid national following. Three-piece power rock trio Flash Lightnin' keep the dance floors shakin' with their hybrid of stompin' southern boogie and electrifying rock. The band wears its influence of 70's ZZ Top and Rolling Stones like a well-worn Nudie Suit, with rhinestone crests of Jack White and the Black Keys. With their extraordinary chops, explosive stage show and reverent yet contemporary approach to blues-based southern rock and roll, Flash Lightnin's weekly residency at The Dakota quickly became one of the hottest nights in the Toronto. This UK acoustic duo comprised of songwriters Celeste Lovick and Chris Ellis begin their Canadian tour in Tofino. They bring a soulful and dynamic set of original songs with alternating lead vocals and harmonies, guitars and grand piano. They were described by the National Theatre in London as giving 'magnetic performances' and having 'well-crafted songs with great sincerity'. For more information visit their website at www.shelteringtree.co.uk. Three tremendous talents, Vancouver-based Brazilian legend Celso Machado, mandolin virtuoso John Reischman and Vancouver's premier percussionist Sal Ferreras combine forces in a concert featuring the irresistible rhythms and sounds from Latin America and the Caribbean. Highly respected individually, by fans and colleagues alike, each artist has developed his own unique musical voice and style. Combined they are a 'tour de force' of musical inspiration and pure entertainment. Don't miss this concert featuring three artists at the top of their form making great music together! Presented by the Pacific Rim Arts Society in collaboration with Festival Vancouver's Spectacular Music BC program. Tickets at Wildside Booksellers, Common Loaf, Mermaid's Tale Bookshop & Wild Heather Books. Tofino concerts in August 2008 from Tofino Time Magazine. Shows at the Tofino Legion and other music events in Tofino.